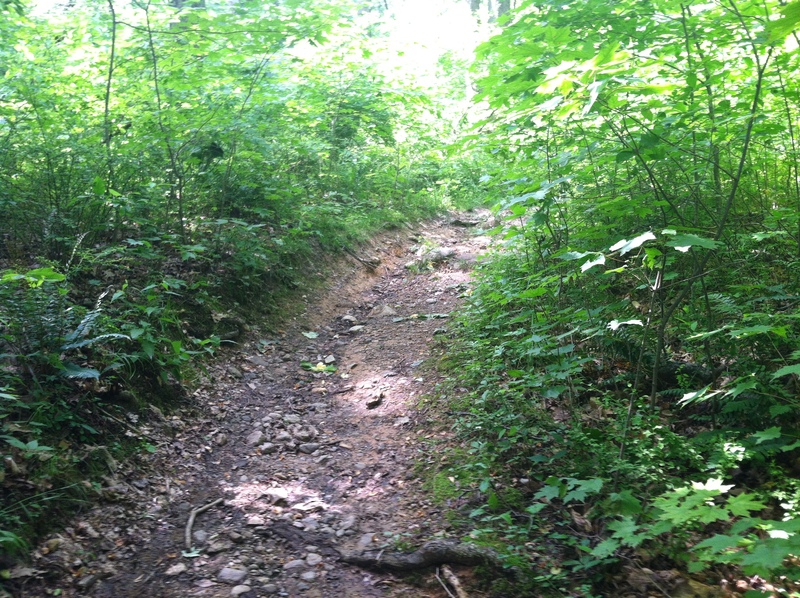 This rocky trail at Allamuchy State Park is challenging for bikers, but not too challenging. I drove into Hackettstown looking for a good trail and found that and more at Allamuchy Mountain State Park on Sunday. Exit 19 off of Route 80 took me to Route 517, which then took me to Deer Park Road. The road goes past a few quaint homes and then into the southern area of the park. So I mounted my bike and hopped onto some single-track trails that took me on a half hour loop and landed me back in the parking lot. There, I encountered Tom, an avid mountain biker, former paratrooper and a police officer. He is thoroughly familiar with the park and offered to ride with me. We went back on the trail, up some hills, down some hills, across wooden planks, and over some logs. It was a thrilling 8 mile ride, and I found myself sucking air as I tried to keep up with him. On our way back, we heard thunder and as we raced through the trees, rain poured down on us. We agreed however that the rain just added to the adventure. And of course when we got back to the parking lot the rain stopped. If you hike or bike at Allamuchy be sure to bring plenty of water and check for ticks after you exit the forest. Also, I would recommend printing a map of the park from the Jersey Off Road Bicycle Association website.